Feeling good about your life is a two-part project – and it’s an inside job. The first part requires you to learn to think about yourself in healthy ways. This is an acquired skill, and not something that a lucky few were born with. The second involves “making things happen”. Seeing yourself being successful at anything are what make up the building blocks of contentment. 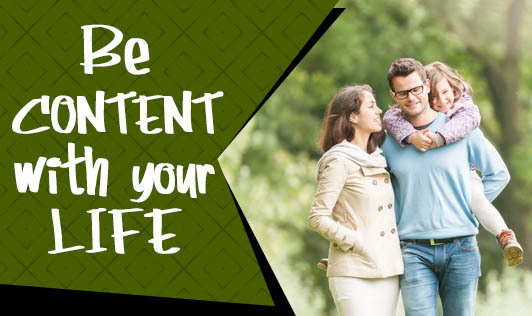 To be content with your life, take a look at these ideas and implement them. Stick the list on your desk and practise making positive changes. Never stop learning. The brain is a muscle just like any other and it will stagnate if you let it rest for too long. Make it a rule to learn something new every day. Then use what you learn to make your life better. Accept your weaknesses. Don’t deceive yourself by thinking you’re the only one with difficulties in life. Everybody has them. Instead of spending your time and energy trying to “overcome” a weakness, make friends with it and make it work for you. Don’t live in the past. There’s nothing about the past that you can change. Make use of today. Today, change what you need to change, and move on to feeling good about your life. Have courage in your convictions. You know what’s right for you. Be willing to stand up for what you believe in. Just as practicing a sport makes you better at it, practicing being positive and happy with your life will bring rewards you may not have dreamed of! Your employers and colleagues will notice the change when you become content with your life, your job and who you are!